L4873 was one of three Blenheims flying in formation on a training exercise from RAF Upwood near Huntingdon. The flight plan took the formation out to the Isle of Man before returning to Cambridgeshire, but over Wales they flew into cloud. The procedure upon entering cloud was for aircraft to break formation and climb out of it. It seems the pilot of L4873 instead chose to dive out of the cloud to try to maintain visual contact with the ground, alas with fatal consequences; the Blenheim crashed into Foel Wen in the Berwyn mountains with the loss of all on board. Aircraftman, second class, K C Winterton, wireless operator/air gunner. 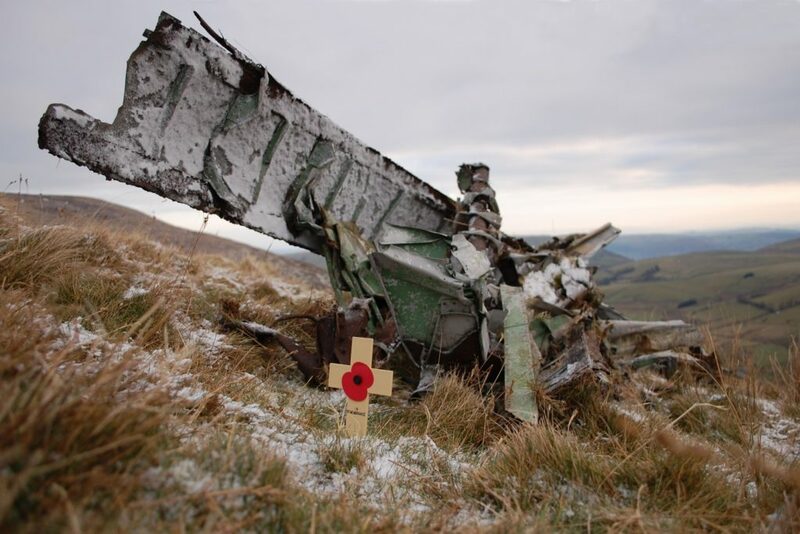 Snow splattered wreckage on a lonely hillside.And that small but incredibly poignant poppy cross. The top shot is a wonderful perspective on the wreckage silhouetted against the sky. Nice history and series of shots as usual Ian. Great angle Ian , the snow helps make it a chilling shot . what i,m thinking is the second it hit the ground,time stood still,until that point the pilot was alive and airborne,living in the clouds,and then,bang,life ends time stands still,a date forever his,no more dreams or hopes or loves just a cold and lonely end. Very strong composition with that piece of wreckage pointing towards the upper corner. And always the little poppy cross… Great one, Ian! for you great catalogs and for keeping those great men and womens menories alive today. do you know how many you have been to and how many more you have left to see? Or are they left alone because they are ‘official’ war graves? I’m also amazed at how you find them all Ian. One last thing. The Bristol Blenheim was one of my favourite airfix models. That, along with a Westland Lysander took pride of place in my bedroom, hanging from their threads of cotton. Great (sad) story. Would like to visit the place!! That’s a good point John, often think that, these places remind me of our own frailty and vulnerability. Like people in motor accidents, they set out in the morning, going to work, thinking about stuff, what they will do at the weekend, that new CD thye’ve just bought… and in seconds the driver of a truck (for example) loses concentration, pulls out and a life is gone in moments. What makes these crash sites more remarkable is the bravery of the flyers, they knew the stats, the extremely high risks. Aviation safety today was learned from the accidents that befell these pioneers. Cheers Chris, I always appreciate your thoughts, on your own photos as well as mine. Just done a quick count, I make it 103 different sites, though some of those have been photographed at different times – weather and light can change the appearance of a site completely. Winter is the best time because the grass, bracken and heather are short so you can find stuff more easily, but then heavy snow makes looking for many sites pointless. My photos scratch the surface, really Chris. I have visited 100 sites, but during the war years alone there were around 10,000 plane crashes, with thousands more in the 1930’s and 1950’s. 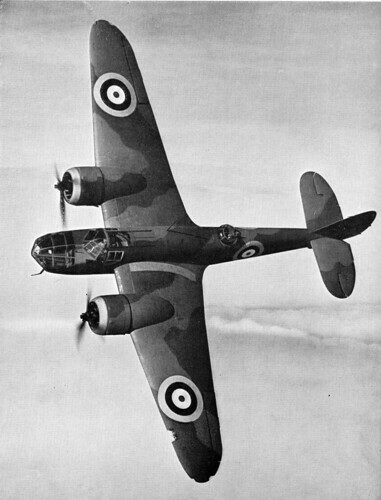 Bristol Blenheims are gorgeous aircraft, always make me think more of a German design than British. There’s one undergoig restoration in the UK at present, don’t know if the plan is to make it airworthy. Wouldn’t it be cool to see a Blenheim take to the air again! 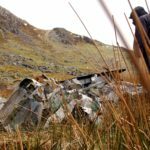 You are right in what you say, plane crashes now usually have everything recovered, though some civilian light aircraft crash sites we have visited have some remains left. But generally, yes it is all cleared away. As mentioned above, the number of crashes during the war was such that it was a daily occurence. Again, it makes us think what that generation – the older men and women we see today – actually went through. Wow, these are so good. Always great info too. Seen in my contacts photostream…….. Walk a year in my shoes, see a wider view, join me up my street or share my iPod. I’ve said it beffore but it needs repeating – The efforts you make and the photographs you publish are performing a great service. We usually only think of the people killed in action. Many also died on training flights or testing aircraft after repairs had been carried out. These crash sites are part of our history and what you are doing is helping to ensure that the people involved and the sacrifices they made are remembered. Thanks Mike, I never get tired of hearing it! And as I keep saying, if I thought people didn’t find it interesting, I’d soon stop doing it. I really value the feedback I get about these photos.